The epic trilogy that tells the tale of Angelo continues in The Trials of Olympus II: Wrath of the Gods. After fulfilling the Grecian king's order to build the most majestic palace on earth, Angelo went on to marry his true love, Princess Amara. Their happiness was cut short when Ares, the greatest god of war, arrived and kidnapped the princess. 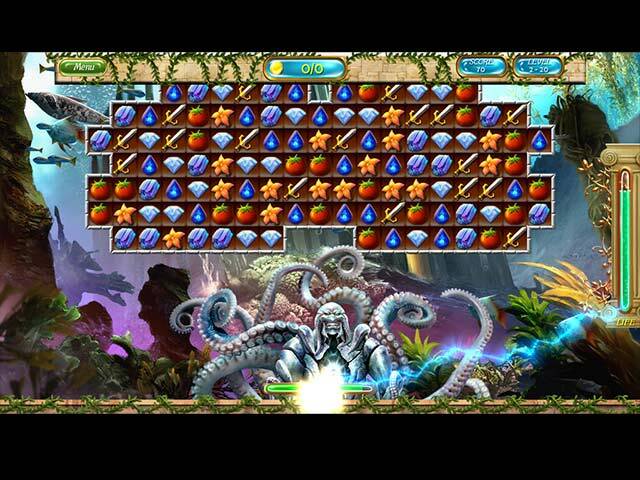 Help Angelo on his quest to make a kingdom with the strongest defense ever seen on earth and save Princess Amara! Explore wonderful yet dangerous locations from the Vortex to the Olympian Sky Kingdom, encounter mighty Titans and defeat ferocious beasts from Kronos to Kraken. 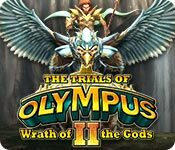 The Trials of Olympus II: Wrath of the Gods is rated 3.3 out of 5 by 18. Rated 5 out of 5 by queenjanis from Games I love these games, and I am sure I will love this one as well. Rated 5 out of 5 by denniann2 from many power-ups a typical M3 but with lots of poer-ups that recharge after you use them as you match the symbol that is associated with it. they change each game. this is a story of a man that has his beloved taken from him and the king is to sick to help him fight for her, but there are others that will help. you build the kingdom up using the coins you get as you play. there will be a sequel and they have already shown it at the end of the game. Rated 5 out of 5 by melissa845 from More Relaxed Mode Available on Trials II if you like strategy Forget the story line and just play the game. Lots of fun for Match 3 gamers. One hint to note is that as soon as one runs out of moves it does not automatically reshuffle. One is required to use strategy and power-ups wisely so as to get through barriers to ones goal. I liked this approach and found it added some interest for me to the game. Rated 5 out of 5 by sandy2499 from A Very Easygoing Match 3! I purchased this game before the trial ran out. Having played the previous in the series I knew I would like this one too. I was pleasantly surprised at the improvements! Very colorful and the play is very smooth. No waiting for the tiles to "settle" (my pet peeve) just smooth playing. Power ups increase fast with a visual of what tile increases what power up. Best of all there is a timed or relaxed option. Rated 5 out of 5 by beckins from Icons are challenging The icons are large and fill the squares, making it a bit harder to discern the boxes that still need to be broken. For me, this brings a bit more of a challenge to the game play. Match 3 is my favorite genre so finding a game that challenges me is appreciated. The music is repetitive but I usually turn it down quite low. The one thing developers seem to have missed is there is no indication of how much gold I have so I have to click on a purchase option to get this info. Not a big deal but there is more than enough room on the main page to have this info tucked up in a corner. I am hoping the game proves to be long as I don't want to have the fun end before I am ready. A definite buy for me! Rated 5 out of 5 by XFreak from Match 3 game with an Epic Storyline! Loved the first game, and appreciate they added Relax Mode! This sequel as high as my expectation. Wonderful artwork & epic storyline to keep me playing this game hours...... plus bunch of challenging levels to beat. Its a recommended! Rated 4 out of 5 by pennmom36 from Tile Elements Are Too Alike And Difficult To Differentiate At Times In the first episode of The Trials of Olympus, we followed Angelo, an archaeologist who constructed magnificent palaces for the Gods. He fell in love with a mortal, Princess Amara, angering the gods who then exiled him to live his life on Earth as a mortal. In this episode, the young newlyweds have angered Ares, the god of war. (probably the last god you would want to anger) Ares journeyed to bowels of the underworld to release the mighty Titans. They became allies of the "Order of Ares" an unstoppable force determined to destroy Angelo, and perhaps even Earth itself. And so it begins............ I will say this, the storyline was fantastic, in the first game, and even better in this game! The music is surprisingly relaxing, and the gameplay itself is fun, I look forward to the final episode of this Trilogy. I was slightly disappointed with the tile elements on the board because the elements were either too similar to tell them apart from one another quickly, or perhaps there were just too many different types all at once. Whatever the reason, I found it difficult at times to find matches of 3 or more identical elements, which made it difficult to achieve a fast time to earn 3 stars. I had to restart one of the levels in the demo, because the third row of the board was completely obstructed with chained elements and there were no available matches to break the chains and no way to generate new elements. My last complaint is two-fold, some of the characters voices were really annoying and even though I love the storyline, it takes too long in between levels to listen to two different characters give their spiel, so I had to choose to sit patiently while the characters move to and fro telling their long winded version, or I had to completely skip the conversations. Perhaps the story could unfold after every 5 or 10 levels, or a dialog box could be used to allow the player to read them quickly and click onto the next dialog box at a faster pace. You can play in a Timed or Relaxed untimed difficulty mode. 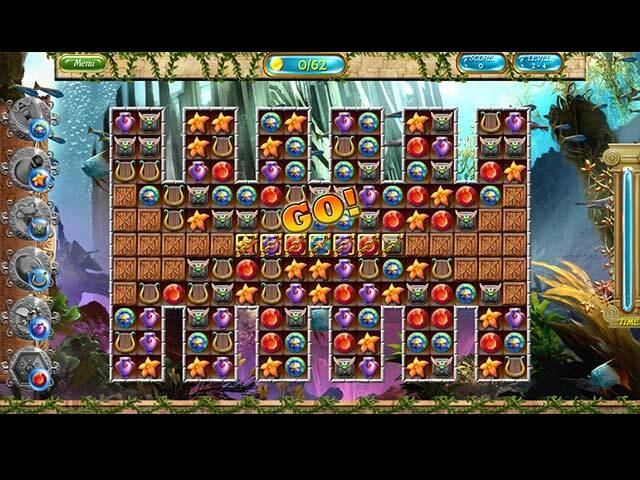 The goal is to achieve 3 Stars per level, you must swap tiles to make matches of at least 3 identical tiles, and you must clear all gold cells and the required number of resources. As you match elements, the mana meter will fill and allow you to use the bonuses. A Gold Bug Axe clears a single tile, the Potion Bomb clears a 4 tile range, and the Magic Pendant collects all of the same tiles you choose, eventually there will be 6 total Bonuses to choose from. Some tiles have chains or double chains that require matches of the same tile that the chains bind, once or twice for double chains, then again to clear the gold cell. Spiders need to be destroyed by making matches under them or they will build webs on several tiles. Some icons have bubbles around them and the image inside is constantly changing. You must click on the bubble to pop it before you can make a match, but you can wait for the desired image to appear before clicking which can help you win. After each level, you will get the opportunity to fortify the Kingdom's existing fortress, or purchase items to keep it's citizens safe. This is an unusual feature because I'm used to having to build a castle piece by piece, not put out a fire. This is a decent Match 3 game, but it still doesn't hold a candle to my beloved Cradle of Rome series, enjoy! Rated 3 out of 5 by tacomataz from OK Game I normally like match 3 games and I liked this one but, when you made matches and the gems dropped down it was real slow. I like building things when you pass a level and this game does that. The graphics are pretty good also. Some are going to really like this game nut as I said early on I just could not get past how slow the gems dropped after making matches. Rated 3 out of 5 by dgeehring from Started out fun but got boring I read some negative reviews but tried it anyway. Found it challenging and fun so I bought it, but then it got boring. Nothing really changes from level to level and if you use the power ups it's pretty simple. Oh well, it was fun for awhile. I'd suggest just doing the trial. Rated 3 out of 5 by deddu from DISAPPOINTED Played this series of games and this one just didn't live up to the others. Several of the icons were too similar and it was hard to see where the boxes were to eliminate, thus the poor visual rating. The boards are also very repetitive. The power-ups are standard: bomb, lightening, etc. As others have stated the first two power-ups provide the most help. If you match five you get a bomb on the board and match 4 and get a small sun which explodes. 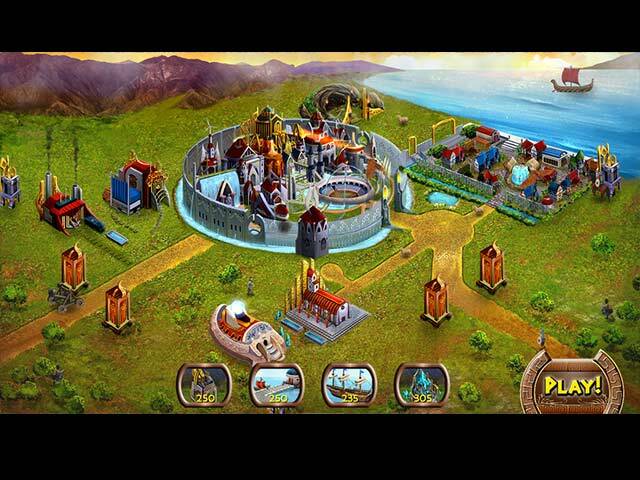 Collect the resources to build the strongest kingdom in this epic match-3 game!